pineapple – Cooking with Gabi – all about integrating Fruits & Vegetables into your daily diet! 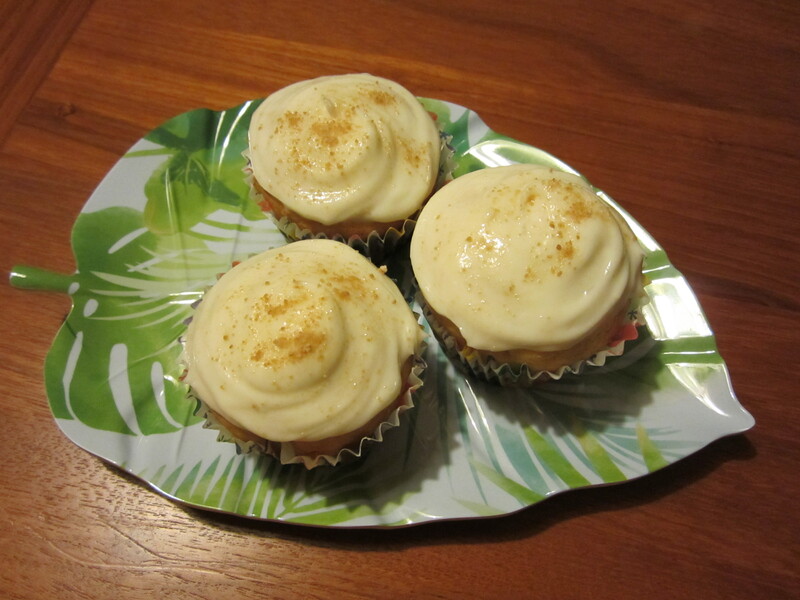 Someone did a wondrous favor for me so I decided to make the most portable gift food…cupcakes! Wanting to create something new, I took pineapple tidbits and pureed them with their natural juice and about a third of a cup of rum. I incorporated that into my dry ingredients, as well as 3 eggs, one stick of melted unsalted butter, and half a cup of fine sugar. Last but not least, I used about a third cup of carbonated water…..mixed that till it was well incorporated and placed them in a 350 degree oven for 17 minutes. For frosting, I let 8 oz. of Neufchatel cheese come to room temperature and mixed it with 3 tablespoons of fresh pineapple juice and 1 cup and a half of powdered sugar. Frosted the cupcakes lightly and then just put a little dusting of maple sugar. Of course I tried one….just had to…and it was good….. Simply delicious Saturday Brunch……Red on Yellow! Woke up super early so went rumaging in my fridge to see what I could throw together for a healthy and delicious breakfast. Started off with two eggs, a little salt and pepper, and chopped one tomato and half of a red pepper. Topped my mix with one tablespoon of grated parmesan and about 2 tablespoons of grated sharp cheddar cheese. Mixed it up well and Voila! – my Red & Yellow Scrambled Eggs…..so delish! Not only did I want to use veggies, but I just adore fruit, so I found I had canned pineapple tidbits and one pear. Took half a flatbread and placed sliced pieces of pear on top, drizzled a little honey and sprinkled ground ginger on top. It went into a 375 degree oven for just a few minutes. In the meantime made mini biscuits and topped them off with a tablespoon of the pineapple tidbits. 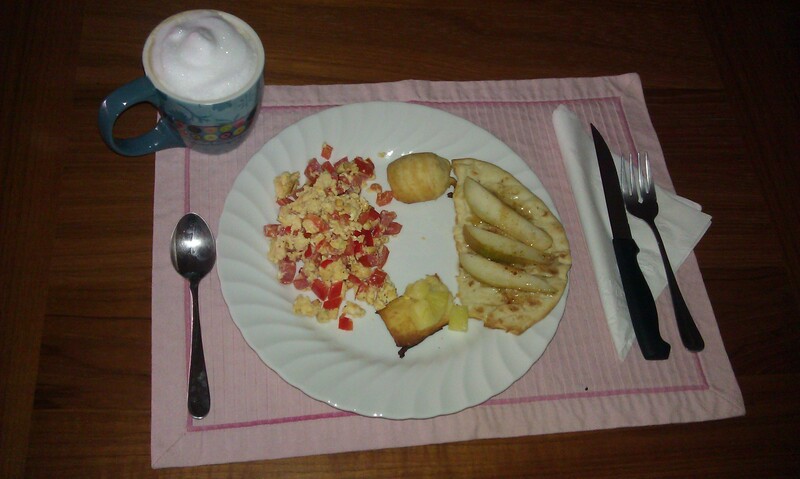 While the eggs cooked, I made myself a cup of Nespresso coffee….and let me tell you…..totally delicious breakfast!